The general theme of today's hop is "feel good" and "encouraging". This immediately sparked the idea of implementing as many rainbow elements into my card because, well, who doesn't feel good about rainbows?! For my background I white heat-embossed a piece of watercolor paper with my Grid Background Stamp. Once it was heat-set, I began adding color using the ink smooshing technique. Basically, you dab a bit of dye ink onto a piece of acetate, add some water to activate it and smoosh it onto your panel. It's really quite easy to do! To make sure that I didn't end up with a weird mix of colors, I started with the primaries: red, blue, and yellow. By doing so I was able to create areas that were opaque red, blue, etc. and areas where they overlapped to create purple, orange, etc. Where they overlapped I decided to further intensify the color by adding ink in that same shade. In essence, I used the primary colors to create a guideline for where I should place my secondary colors. Ya get what I'm trying to say? If not there's a video tutorial below! I set my panel aside to dry and started working on my sentiment circle that I die-cut from my Sweet Stitches Die Set. Onto the center of it I stamped a greeting from my Color in Sentiments set which coordinates perfectly with my rainbow theme. I made sure to stamp it in a waterproof ink as I knew I was going to fill in the "smile" with watered-down dye ink. I added all the colors I used onto my background (listed below), picked them up with a waterbrush and colored in my word. Lastly, I flicked on some color to the center of some flower die-cuts from the same die set. I also colored the centers and leaves with the same inks from the rest of my project. #watercolorallthethings I popped up the circle, flowers, flower centers and used liquid adhesive for the leaves and my card was finished! My friend Holly of HollyBeary Creations is participating with me as part of Right at Home. You can click the button below to hop over to her post. If you want to participate in today's hop then make sure to head over to the main post here for more information. There are over $800 worth of prizes up for grabs including $20 to the Right at Home shop so you'll definitely want to join in! The deadline for uploading your project to the gallery is Sunday, April 8 at 11:55 PM CT.
Do you have your tissues ready? I'm sorry to say this, but welcome to the last day of the National Craft Month Celebration with Right at Home + Friends. I hope you've enjoyed the past nine days of inspiration and video tutorials on my blog and YouTube channel. It's definitely been a journey but one filled with lots of fun and crafty vibes. For the last day of the celebration I'm honored to welcome Joan of Dear Paperlicious. Joan challenged us to use a background stamp for our designs and omg I don't think there has been a challenge this week that is more "me". If you've been following along then you'll know what I mean. For today's card I decided to push myself with my creative thinking and try to use a background stamp in a new way. I also wanted to incorporate the flower included in my Sweet Stitches Die Set again as I loved how it looked on yesterday's card. Why not combine the two ideas? So I stamped the little die-cuts flower with my Gingham Background Stamp and I am in. love. I mean, gingham flowers?! 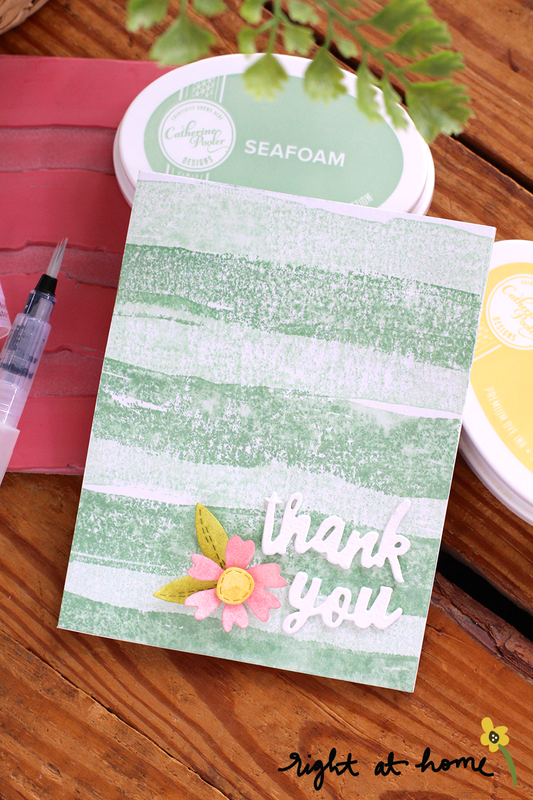 I used a variety of Catherine Pooler inks in the sweetest of spring hues: It's a Girl, Mint to Be, Sweet Sixteen, Party Dress and Daydream. For the leaves I die-cut them from white cardstock and inked them with Lime Rickey. The centers were inked with Shea Butter. This color works perfectly for flower centers! I popped the centers onto the flowers with some foam tape and began arranging them on a stitched rectangle panel cut with my Find the Beauty Die Set. I did not glue them down at this point...I just wanted to find an arrangement I liked. I made sure to leave room for my "hello" die-cut which is also included in my Find the Beauty Die Set. Onto the center of the panel I inked with the same Shea Butter color to act as a background for the flowers. Once my background was inked to my liking I adhered the flowers with liquid glue. I also glued together three layers of the "hello" die-cut to create a dimensional sentiment. Along the bottom of the layered die-cut I inked on some Shea Butter to help it blend into the background. I popped the panel onto an A2 sized kraft cardbase and my card was complete. And make sure to head over to Joan's post to see her take on this challenge. I know she was really excited about her project! My idea behind this celebration is offer you loads of inspiration from some of the most amazing crafters and companies in our industry. Each day will present a new creative challenge that you can participate in and, in turn, be entered to win the day's prizes. Today's prize is a $20 gift certificate to the Right at Home shop! Please let me know if you have any questions in the comments below! If throughout the week you see something I used that you just have to have you can use the code NCM in my shop for 15% off your purchase! Code ends tonight at midnight EST. If you've been participating in my celebration or just following along I thank you for doing so. This has been such a fun experience for me as I tend to get into creative ruts every not and then. The challenges were a great catalyst for stepping outside my comfort zone and trying new techniques. I hope you experienced the same with your crafting. Within the next day or so I will be posting a round-up of all the projects shared by me as well some of my guests. I'll also try to include some listed under the hashtag #NCMwithRAH on Instagram and posted to my Facebook group. Make sure to add yours! Remember you have until April 1st to enter to win one of the over $200 worth of gift certificates available! Hello Monday, hello day #8! Yes, 8! I'd love to keep the National Craft Month Celebration with Right at Home + Friends going all month long but, sadly, this party must come to an end sometime. BUT today is not that day! *wipes tears* So grab your favorite craft supplies, brewed drink of choice and help me in introducing Lydia of My Sweet Petunia! Lydia chose our inspiration for the day and decided to challenge us to use a water-based medium to create a background. Sounds like something right up my alley! I grabbed a few things that I've been obsessed with lately and used on several cards throughout the week and got stamping. I started by mounting my Watercolor Background Stamp onto the door of MISTI. I made sure to remove the foam insert in my stamping platform as the background stamp is rubber and already has enough dimension to create a crisp impression. I added a piece of A2 sized watercolor paper into the center of my platform and placed down my magnet to keep it in place while I stamped. I inked up the background stamp in Mint to Be ink and spritzed it lightly with water to get the color moving. The Catherine Pooler inks are water-based and can therefore be used with water to create watercolor effects. I stamped it onto my background and decided to stamp it again as the color was too light for my liking. Next I rotated my paper and moved it up a few squares on the mat so as to stagger my stripes. I stamped my next layer in Seafoam which I also spritzed with water. Once my panel was dry I moved on to my flower. I die-cut all the pieces using my Sweet Stitches Die Set. I colored the flower in It's a Girl, the leaves in Green Tea and the center in Shea Butter. I also die-cut three "thank you" pieces from the same die set and layered them with liquid adhesive to create a dimensional sentiment. I adhered both the flower and sentiment to my watercolor panel, glued it onto a cardbase and my was was finished! And don't forget to head over to the My Sweet Petunia blog to see Lydia's creation. She's a master with water-based products so it's a project you won't want to miss. Today's prize is a $50 gift certificate to the My Sweet Petunia shop! If throughout the week you see something I used that you just have to have you can use the code NCM in my shop for 15% off your purchase! Code will last from today until next Tuesday at 11:59 pm EST. Today was originally supposed to be the last day of the celebration, but one of my crafty friends and I decided to make one more day of inspiration. Because, why not? Make sure to check back tomorrow for the last day...and, if you've been enjoying this week, bring your tissues! I'm the Gilmore Girl-loving, chips & salsa eating crafter behind Right at Home. On this blog you'll find dozens of project ideas using my collection of stamps & dies, as well as little peeks into my creative business journey.